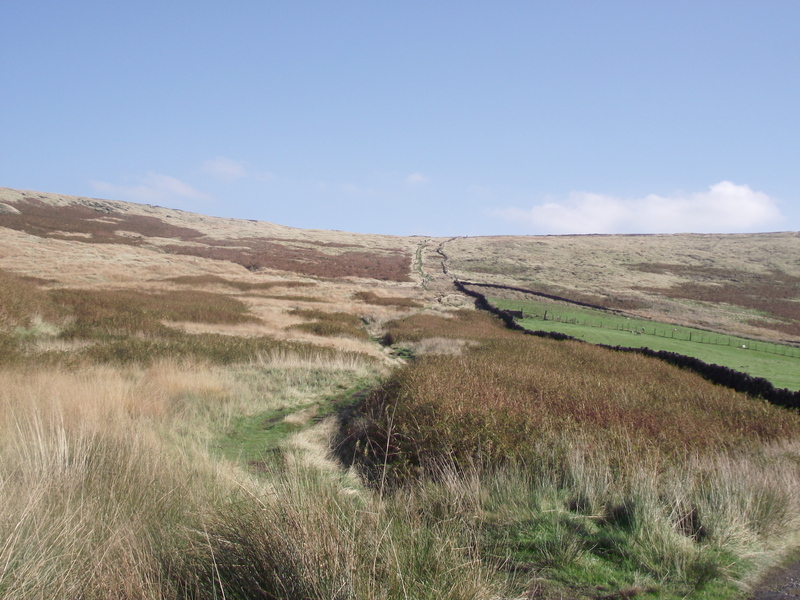 I’ve previously proclaimed my allegiance to gritstone edges and peat moors in this blog, and as a true Lancastrian you wouldn’t expect me to say anything else. The trouble is, I’ve been spoiled by years of walking and climbing in the Lake District, Snowdonia, Scottish Highlands and abroad, so the dubious pleasures of wading through knee-deep peat bogs are even more dubious than they were in my youth. 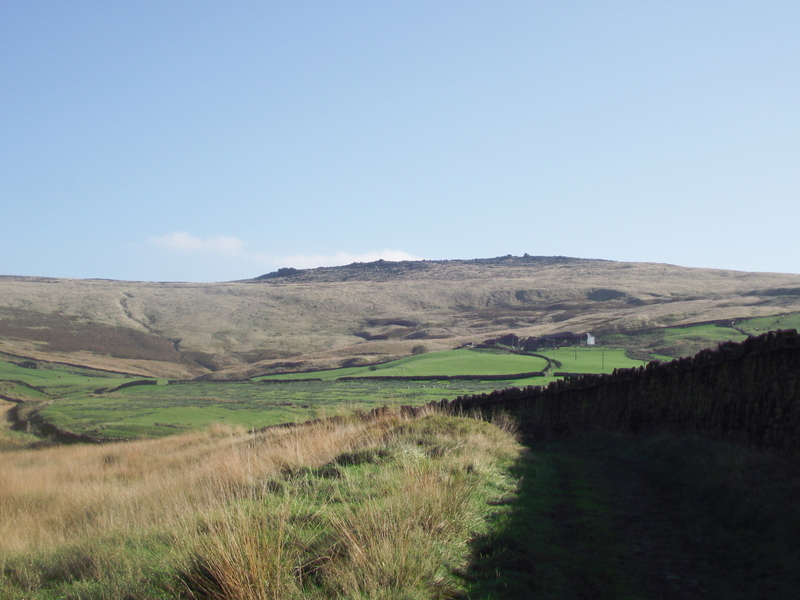 My early walking days were on the gritstone moors of North Lancashire, but I never really got to know the edges and moors of South Lancashire or the Peak District, so this year I’ve been filling in some of the gaps. 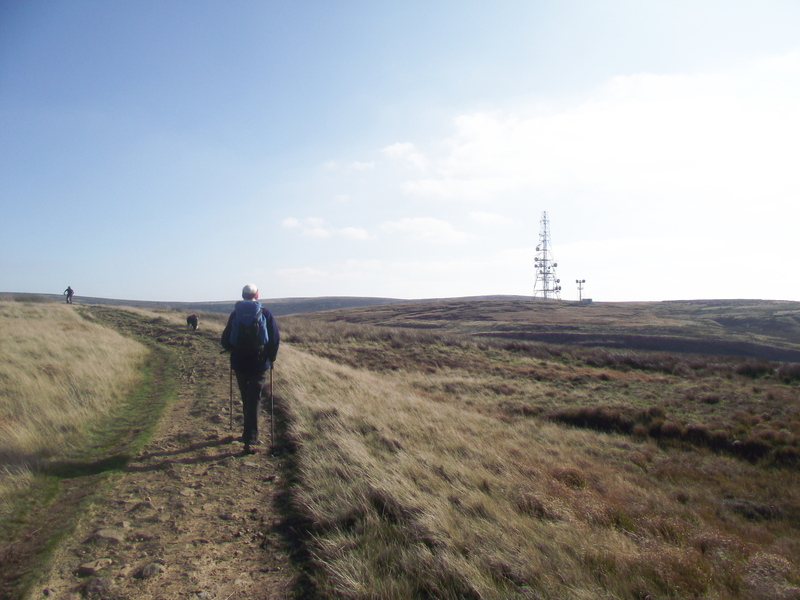 Bleaklow (#19) was an early trip this year, followed more recently by the Saddleworth Edges (#44) but I had never set foot on the moors adjacent to the M62 – time to have a look at Blackstone Edge then. It all starts out in a very pleasant (but very manicured) way at Hollingworth Lake near Littleborough. You could walk these paths all day in your best shoes and come back clean, but before long the route starts to head for the heights and the “black stuff”. 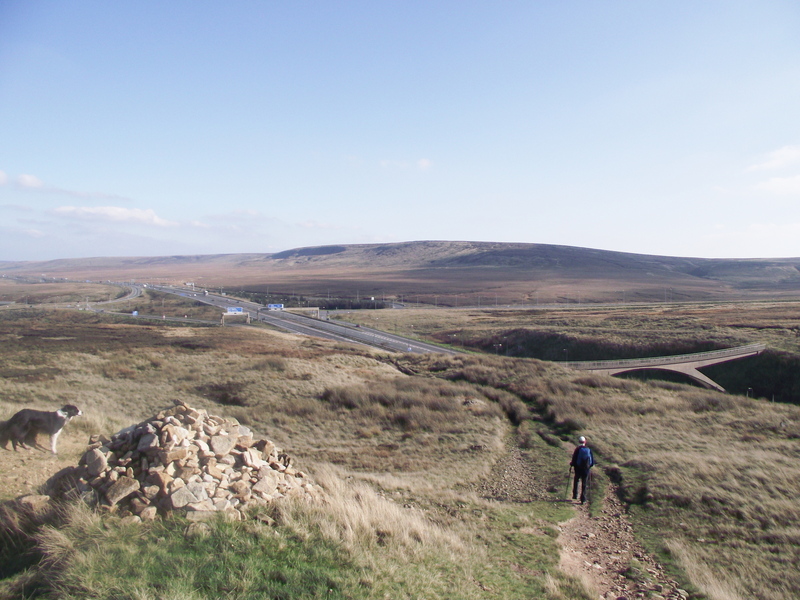 Beyond Lydgate there was a feeling of history starting to creep in, and no wonder – this is where we joined the so-called ‘Roman Road’ next to the A58 Trans-Pennine road. 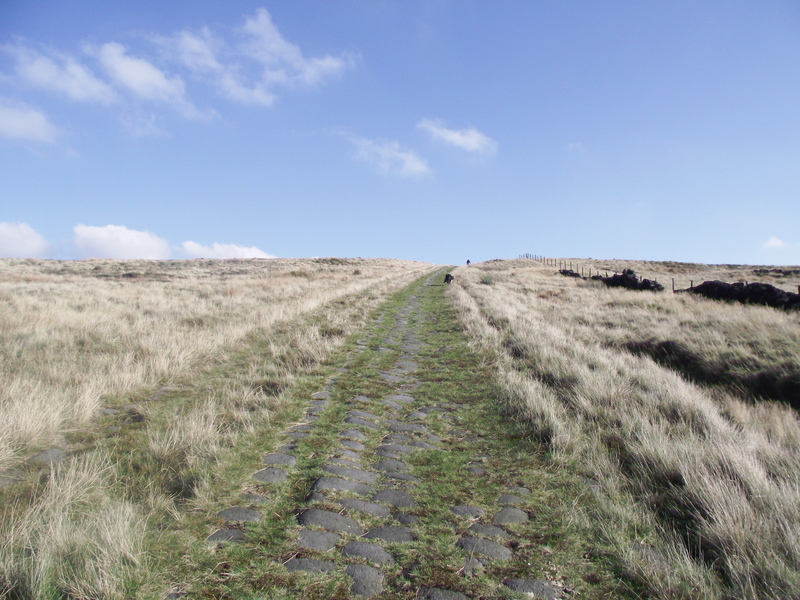 I say the so-called Roman Road, because some experts have disputed its Roman origin – the road probably follows the line of a Roman road, and is certainly medieval, mentioned in records dating back to the 13th Century. It runs straight as a die for over two miles, with a well preserved paved section and a central drainage channel. 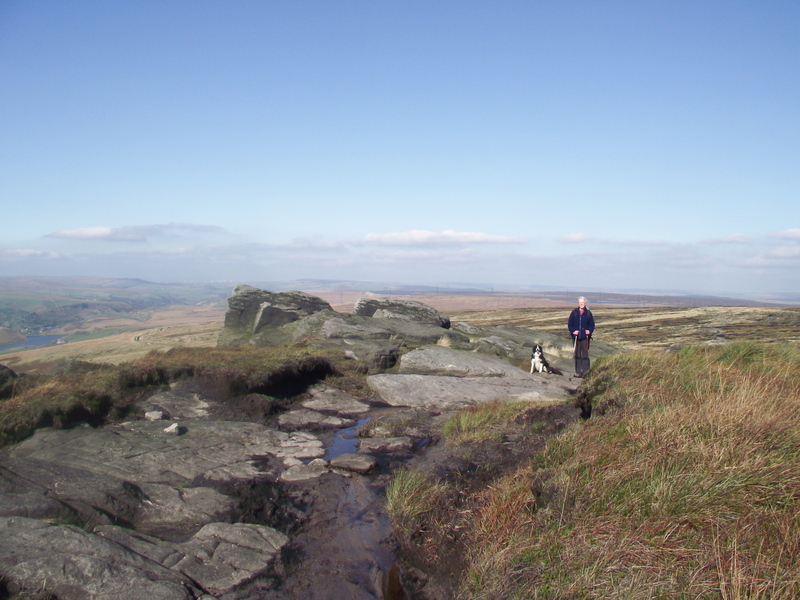 It also gives speedy access to Blackstone Edge, whilst keeping your boots clean as well. Just before the highest point on the Roman road there is a 600 year old boundary stone called the Aiggin Stone. Earlier references have the stone as being 7 feet high, but in the 1930’s it was found to have toppled over. It was re-erected in 1933, only to fall over yet again – since then it has been re-erected in 1978 and 1979. 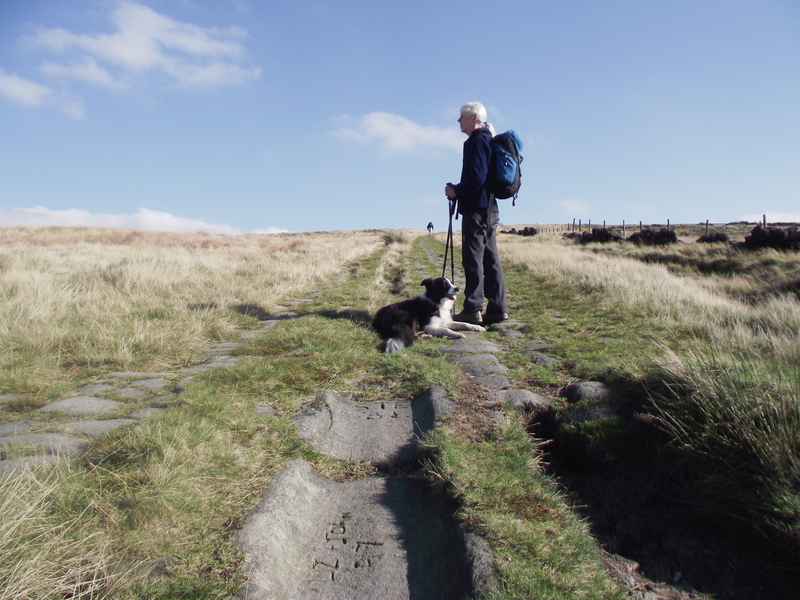 At the Aiggin Stone the Roman Road meets the Pennine Way, which heads south to the summit of Blackstone Edge. 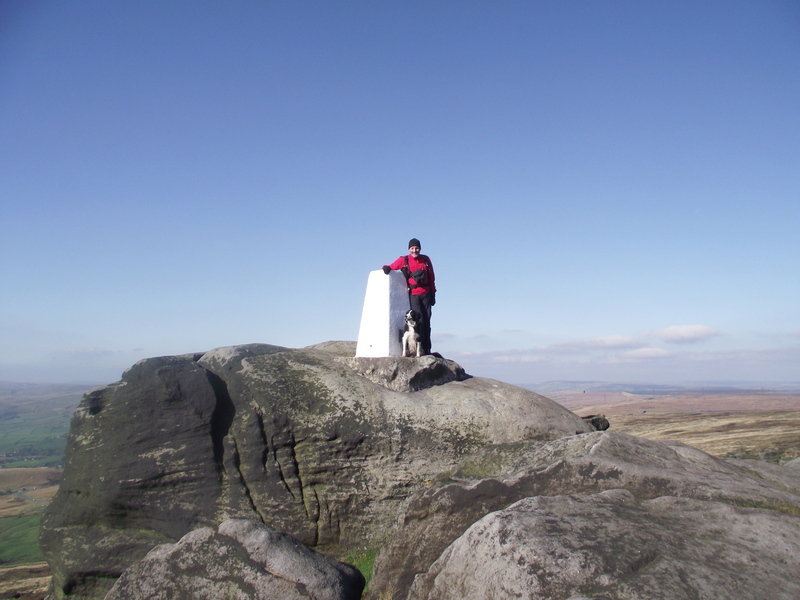 The crest of Blackstone Edge is a classic gritstone edge, with black gritstone crags and loads of nooks and crannies giving shelter from the wind – there is also a Trig Point perched on a boulder as an extra attraction. From Blackstone Edge the Pennine Way continues south to cross the M62 near Windy Hill, better known to motorists as Junction 22! 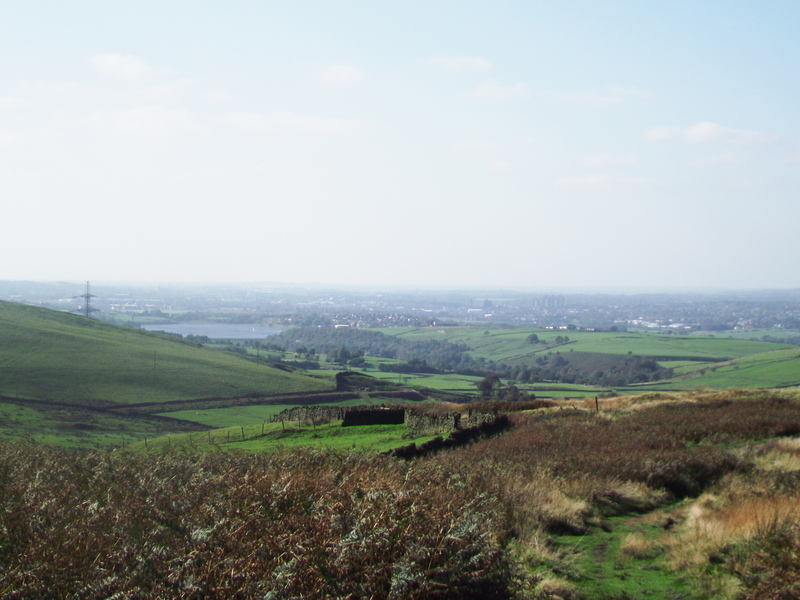 The M62 is probably loathed, or at best endured, by thousands of commuters, but it is a fantastic feat of engineering and England’s highest motorway – it also allows easier and faster access to the hills and mountains, which I class as ‘a result’! There was recently an item on our local TV news about the M62 being exactly forty years old, so a quick chorus of “Happy Birthday to you….” seemed appropriate. 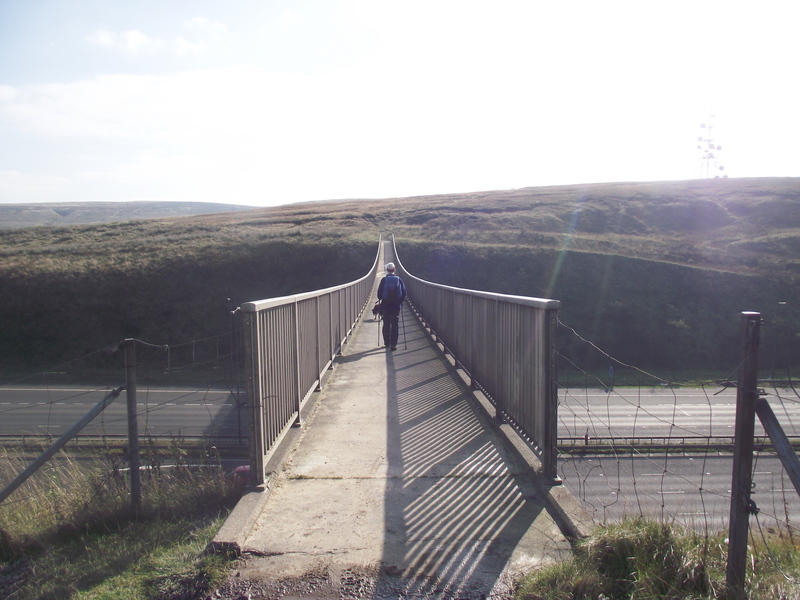 After crossing the modern Trans-Pennine route by the narrow footbridge, we headed west down a much older Pennine crossing, the Windy Hill bridleway. 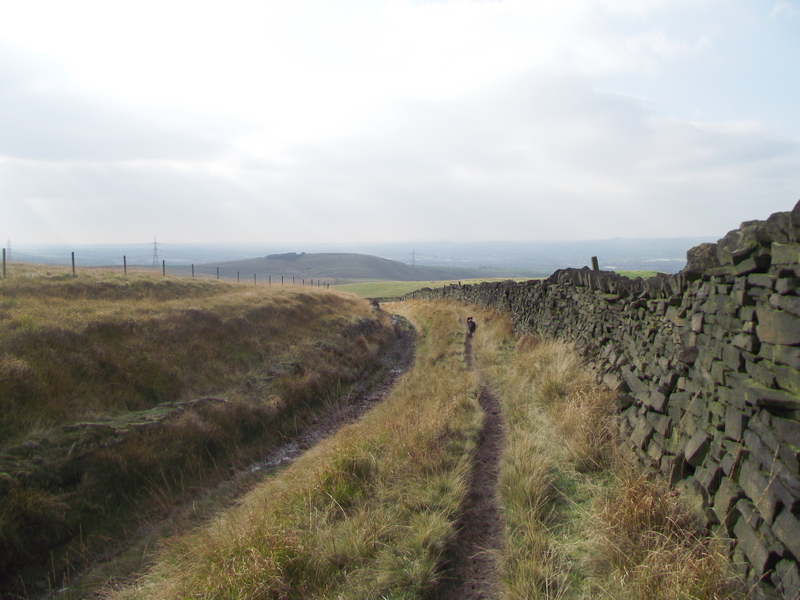 Initially following the crest of a broad ridge, it was amazingly dry, and remained reasonably so lower down where the bridleway was walled on each side, looking very much like a drove road. 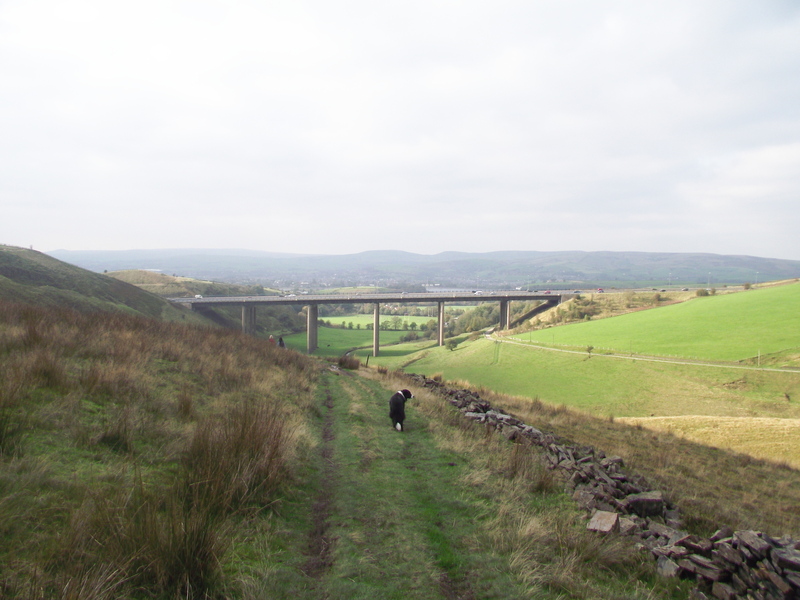 We followed this ancient route for nearly 4 kms, with the modern upstart M62 parallel to us, until the time came to pass under the 840ft long and 140ft high Rakewood Viaduct, leading us back to Hollingworth Lake. p.s. 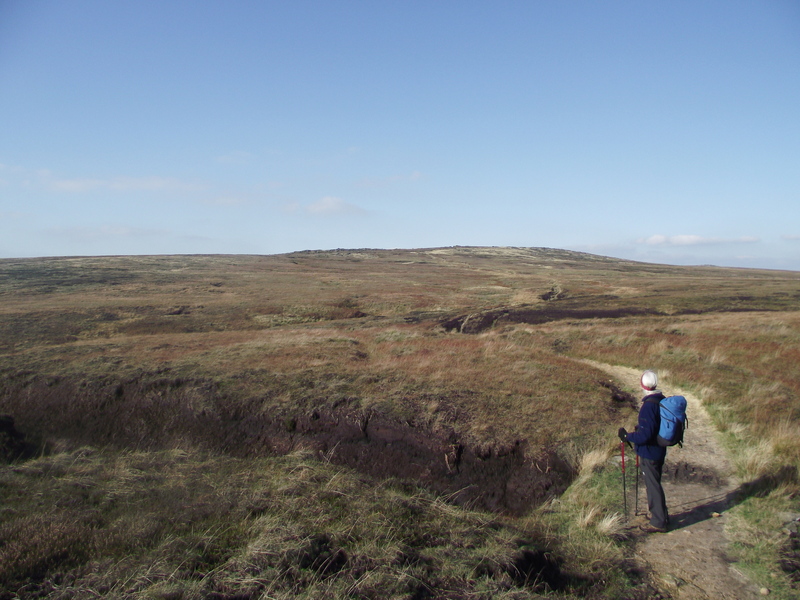 These gritstone moors must be losing their touch – we arrived back at the car with scarce a trace of peat on boots or trousers! This entry was posted in 4. 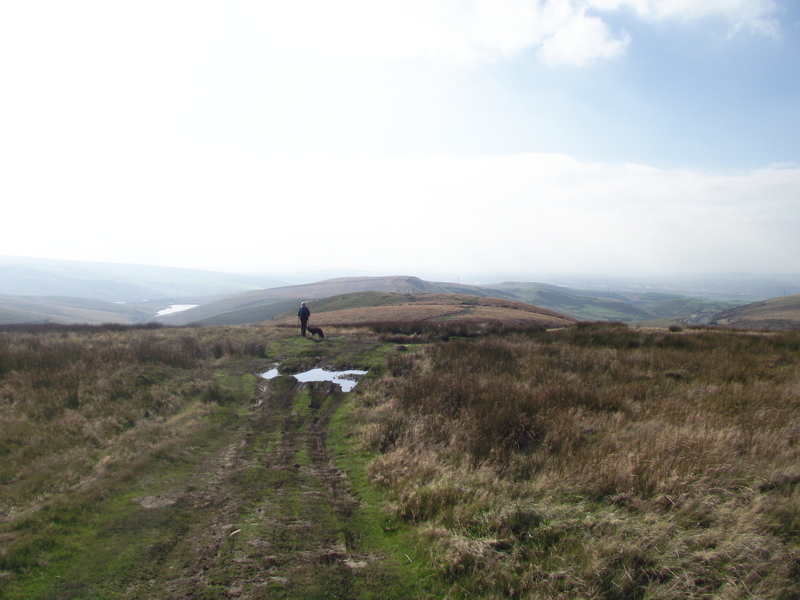 Northern England and tagged hillwalking, Pennine Way, Pennines. Bookmark the permalink. 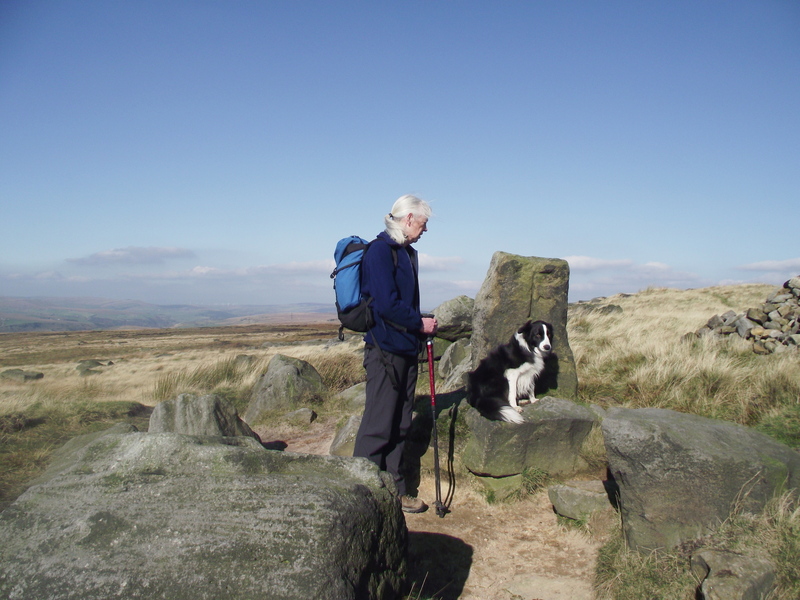 8 Responses to #49 – Blackstone Edge, back to “True Grit”. Thanks for the comment, Mark. 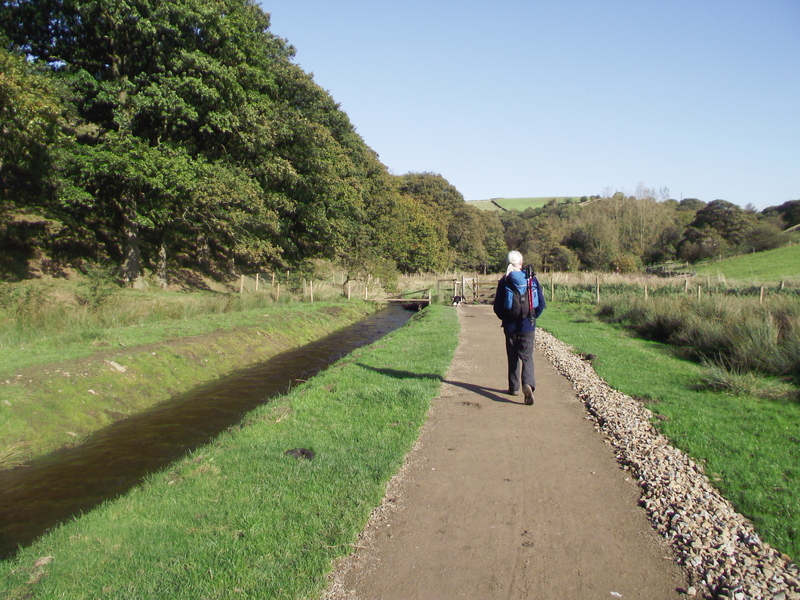 I had never previously thought about walking the Pennine Way, but seem to be doing in installments – I quite expect that one day I will find I’ve done it by default! Paul, it is pretty easy to walk in sections using public transport to get you back to the start point on each section. 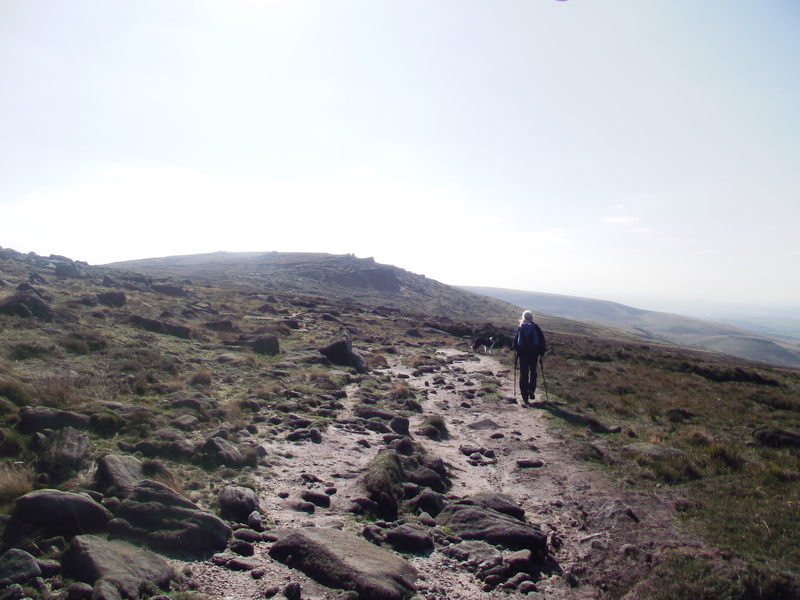 From Edale up to Tan Hill ( about half of the way is fine).. I have done this so far. It is the second half which requires longer trips as there is no easy way to get back on day trips. Hi Stan – thanks for dropping in. Really goos advanture and thanks for sharing!